Over the past year, I’ve been experimenting with different substrate types for my Lithops. 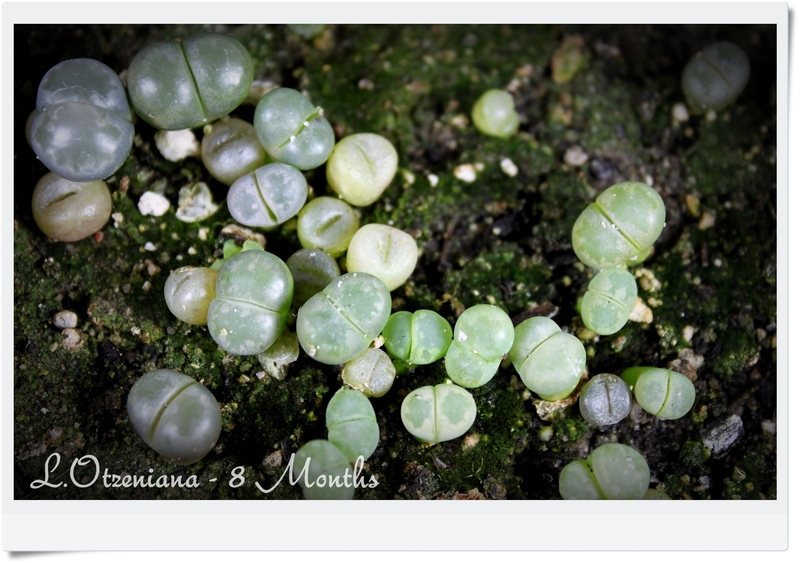 I whole heartedly agree that adult Lithops belong in a nutrient poor, well-draining, course mix. The risk of rot is very high when one uses commercial potting soils; at least, that has been the case in my experience. Seedlings, however, have proven to be entirely different. I have noticed that seedlings grown in the same nutrient poor, well-draining, course mix favored by mature Lithops are slow growing and remain small through-out their first year. I’ve had excellent germination and survival rates in these pots, but the seedlings have failed to really thrive. In contrast, seedlings grown in 50% commercial cactus soil and 50% course mix grow quickly, complete their first leaf renewal, and attain a decent size (one which would allow re-potting) within 9 months. Germination rates are consistent with the soil-less pots, but survival rate is a little lower as there will inevitably be some dampening off. I also consistently have an overgrowth of algae in these pots, but it doesn’t seem to bother the seedlings much at all and is soon forgotten once the robust plantlets are transplanted in their soil-less adult mix (usually shortly after their first leaf renewal). These are my observations. I’m not passing judgement on which method is actually correct. I have yet to see these soil-less seedlings become fully mature and it is completely possible I will prefer their compact bodies to the bloated bodies of those originating from the richer pots. I do like the idea of keeping the seedlings in their original substrate over a longer term then has been possible with soil mixes. But one definitely must be more diligent with watering soil-less pots as they do dry out much more quickly. I suspect my lazy watering habits have contributed to the small size of these plants, at least a little.